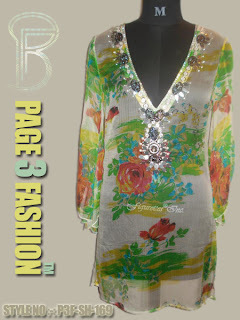 An impressive white color, deep V neck, long sleeve beautiful ladies tunic has chic and attractive floral print and beautiful Indian hand embroidery on neckline with fine quality beads, stones and sequins. It is simple yet attractive for any beach and resort. •	A tunic that will add modern look to the wearer. •	Prepared from fine quality Nylon fabric. •	Ideal tunic for any beach and resort. •	Attractive hand embroidery and print.